Hot Flash, an all natural herbal supplement from Source Naturals, the makers of Eternal Woman, is indicated for the relief of hot flashes caused by menopause. Hot Flashes are just one of the bodies ways of reacting to significant drops in estrogen. Using phytoestrogens, Hot Flash from Source Naturals claims to be able to reduce the number of hot flashes experienced by menopausal women. Black Cohosh Extract- Black Cohosh Extract can help relieve some symptoms of Menopause. Dong Quai- Dong Quai is ineffective in the treatment of menopausal symptoms. Licorice– Licorice is not proven to be effective for the treatment or relief of menopausal symptoms. Chaste Tree Berry- Chaste Tree Berry can reduce PMS symptoms. The recommended dosage for Hot Flash is 3 tablets each day with a full glass of water and a meal. To see good results for Hot Flash, use it for at least 4 weeks. The price of one bottle of Hot Flash is $13.50. In each bottle you get 45 tablets. Throughout our extensive research done, we have found that the product Hot Flash comes with absolutely no guarantee. 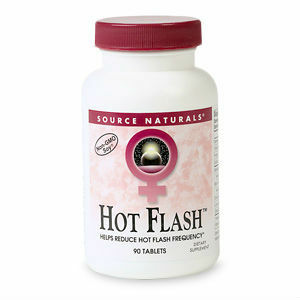 Hot Flash from Source Naturals uses only one ingredient that has been proven to be effective for the relief of menopausal symptoms such as hot flashes. Jackie Horowitz	reviewed Source Naturals Hot Flash	on December 14th	 and gave it a rating of 3.